Topic: The Server Banner Thread | Video Games AWESOME! This topic contains 29 replies, has 21 voices, and was last updated by mvdenk 4 years, 6 months ago. Ok, for those that don’t know (IE: those that don’t watch any minecrafters on youtube, don’t pay attention to the weekly chunks, any of mojang’s twitter accounts, the wiki, or the other thousand or so places already talking about this feature) there will be Banners in the next update. They are relatively simple to create for the most part, and have an amazing variety of stackable designs. The purpose of this topic is for people to post the banner designs that they will be using for their respective communities, as well as personal banners that you will be using. I’ll be changing the topic title to community banners once the update comes out as well. There are plenty of things you can do with it. One I plan to use is the canadian flag: http://algoin.de/bngn/?=15.1-ts.1-bs.1-mc . However, the main one for my build area will be this: http://algoin.de/bngn/?=0.7-bri.3-ss.1-ms.11-mr.10-mc.4-tts . So, show us your banners. This topic was modified 4 years, 9 months ago by luckysimon. This topic was modified 4 years, 7 months ago by luckysimon. This is the one I want to use for my personal builds! I am so excited for this update! Man, this would have made the olympics episode soooo much easier. This reply was modified 4 years, 9 months ago by luckysimon. Nice program, played around with it and made some neat banners. I didn’t think to save the designs in the program, but it helped me to make these yesterday. Definitely a fun addition to Minecraft. That should make decorating Five Flags much better when the time comes. I’ll still use the old way for the giant flags and section entrances, but I can now have smaller versions of the flags throughout the different sections. of course, they’ll be a bit simplified with game limitations and all. http://algoin.de/bngn/?=15.1-ts.1-bs.4-tr – The simplified version of the fraser flag, just can’t include the face. http://algoin.de/bngn/?=11.13-bs.4-rs.11-ts.1-flo.9-mc – Simplified Becky Flag. Not as good as the others I think. I managed to make a banner I quite like. I present to you, the possible future banner of Mobius Alpha. The bottom half is the Hidden Palace with the Master Emerald. The top half is sky. This reply was modified 4 years, 8 months ago by jimbojj26. This reply was modified 4 years, 8 months ago by . Wow, there are some really good design one here. Some of you are insanely creative. the previous one gave me the idea of an outlet, it seemed fitting for redstone. 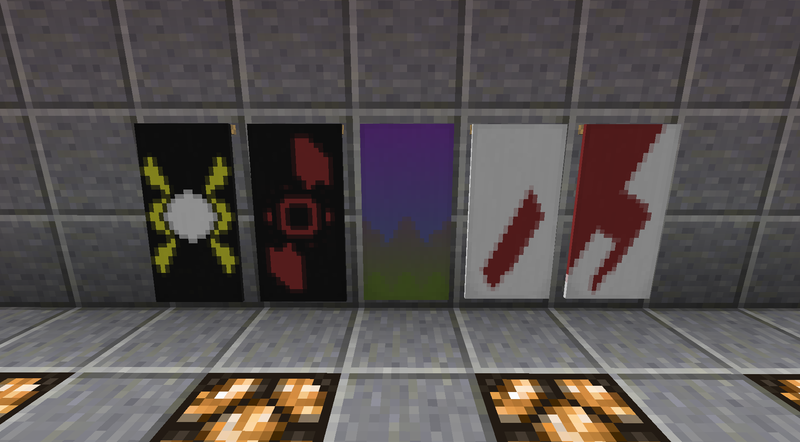 I’m also thinking of making some standardized banners. IE: Ones that are meant to mean things like ‘hotel’ ‘smith’ etc. If I do, I’ll leave some templates for them in a hub chest and a few stacks of banners so people can copy over for them. Does this seem like a good plan for folks? I’m fully willing to take suggestions for these designs as well. This reply was modified 4 years, 8 months ago by luckysimon. I acquired a nether skull to make the danger signs. I also tested and yes, you can edit banner copies. This reply was modified 4 years, 7 months ago by isophist. Official Banner for Haunted Ridge territory and the village of Dreadmare, similar to our main flag, but not entirely identical. I’ll probably use this flag for my builds and the city house and some farmland in the middle of nowhere of Little Shuggazoom.